Prenton Park has a capacity of 16,789 and is a very smart looking stadium considering the level the team currently play at. The cowshed is behind the goal and home to the away fans. Both this stand and the Kop at the opposite end of the stadium have unobstructed views of the action and are relatively new builds therefore providing very good facilities. The main stand runs alongside the pitch and comes complete with two pillars. These are fairly central but also fairly low down so there's a good chance they may at some point hinder your view of the playing field. 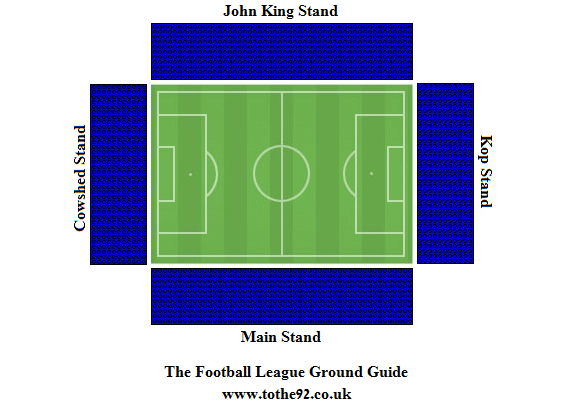 The final stand is the John King stand and is the smallest of all four. It's another early ninety's build and is pillar free offering terrific views of the other three stands. And the game obviously. Visiting supporters are situated in the cowshed behind one of the goals. Seats here are generally in good condition and the views of the pitch are good. As few teams bring enough away support to fill the Cowshed, you can normally pick the best seats available. There are toilets and refreshment facilities on the concourse which are in better condition than those in other stands and a licensed bar so you can get a pint or two before the game. There are a number of decent pubs close to the ground. The Sportsmans Arms and the Mersey Clipper are both popular with home and away fans. Another option is the Prenton Park Hotel although it has recently introduced a policy of doormen on match day and instigating a complex home and away policy whereby you'll get asked a killer question such as 'home or away?' and the accent you reply with determines whether or not you get in! The Mersey Clipper is more fan-friendly for away supporters and has recently added a new outdoor terrace which is nice in the summer! There are several fast food outlets along Borough Road, including Sayers bakers, Captain Tony's Pizza Emporium, Ruby's chip shop, Eastern Delight Chinese and a couple of cafes and plenty of newsagents, off licenses and general stores. Parking is available at the stadium if you arrive early enough. If you don't, there is street parking available although you'll need to be aware of the permit holders parking areas. These seem to be popping up quicker than I can keep updating so when parking, make sure you're ok to leave your car there. The nearest / closest train stations to Tranmere Rovers' Prenton Park Stadium are Birkenhead Central and Conway Park Merseyrail stations on the Wirral Line. From Liverpool Lime Street go underneath the main concourse and follow signs. You should still expect a walk of around 20 minutes to the ground. However, the stations are within a couple of minutes walk of the central bus station from where several buses run past the ground. Merseytravel also offer a Soccerbus service from Birkenhead Central and Hamilton Square stations which runs from 90 minutes before kick off at 15 ? 20 minute intervals until 20 minutes before kick off, and for 20 minutes after the final whistle. If you book your Soccerbus ticket with your train ticket, the service costs £1 return or paying on the bus itself will cost ?1 each way. The service is free for those with free travel passes, saveaways, solo or trio tickets. An alternative is to use Rock Ferry station and make the 25 minute walk to the ground up Bedford Road, Bedford Avenue and Bedford Drive to Borough Road. For further information about journeys by public transport, visit the Merseytravel website at www.merseytravel.org or try the 24 hour hotline on 0870 608 2 608. Travel: Walked - its my local team! If you're on public transport main line trains will bring you into Liverpool or Chester. If you go to Liverpool Lime Street, the Merseyrail underground entrance is in the station. Get any train to Hamilton Square and then a cab; or the Chester/Ellesnmere Port line to Rock Ferry and then a 15 minute walk. If you get the train to Chester any Liverpool train will take you to Rock Ferry. Leaving Rock Ferry, turn right up Bedford Road, carry on into Bedford Avenue and then Bedford Drive. When you get to a Co-op store turn right onto Borough Road and you'll see Prenton Park in front of you. Refreshments: There are 2 pubs very close to the ground. The Prenton Park Hotel and the Birch Tree, both get very busy on match days and getting served can be a long wait. 5 minutes walk up the hill from the away end you'll find the Sportsmans Arms, which does a good selection of beers including Birkenhead's own Peerless, and well priced pub grub. Away fans are always welcome. Impressions: Prenton Park is a big ground for the level, and although largely rebuilt in the 90s is still typically British with 4 different sized stands, which have been a bit neglected. My seat has been hanging off its rusty frame for 3 years! The scoreboard is out of action and the catering has been questionable. Fortunately the club starts life in the National League under new ownership and lots of refurbishment has been going on. Broken seats repaired or replaced, a new scoreboard, new match day food and drink and a whole lot of optimism abounds after several gloomy years. The atmosphere can be low key, not a surprise given recent performances on the pitch, but when a good crowd is in its a noisy place. Visitors are in the Cowshed, virtually on the touch line, and get a great view of the action. Facilities: The loos are OK in the Cowshed and match day food is the usual burgers/mars/coffee. You can get an overpriced lager in a plastic bottle too. Along Borough Road you'll find takeaway pizza, Chinese and Fish'n'chips so you won't go hungry. Leg room is average; not great, but your knees aren't jammed against the seat in front. Exit: Leaving the ground isn't a problem. Visitor's coaches are usually parked right outside the Cowshed at the final whistle, and the main roads are closed to traffic for 10 minutes. Enjoy: I imagine a trip to Prenton Park will be popular in the National League as most of the non league clubs haven't been before and theres several former league sides who haven't been for a few years. My last visit was of course a disaster; we went out of the football league...but the atmosphere can be very good and theres plenty of optimism about a fresh start for the club. 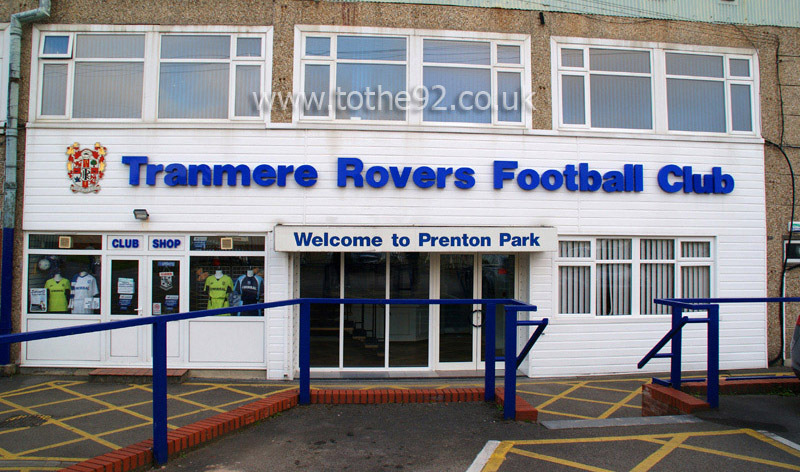 Have you been to Tranmere Rovers' Prenton Park? To tell us about your experiences and to feature on the site, simply complete the fans review form below!